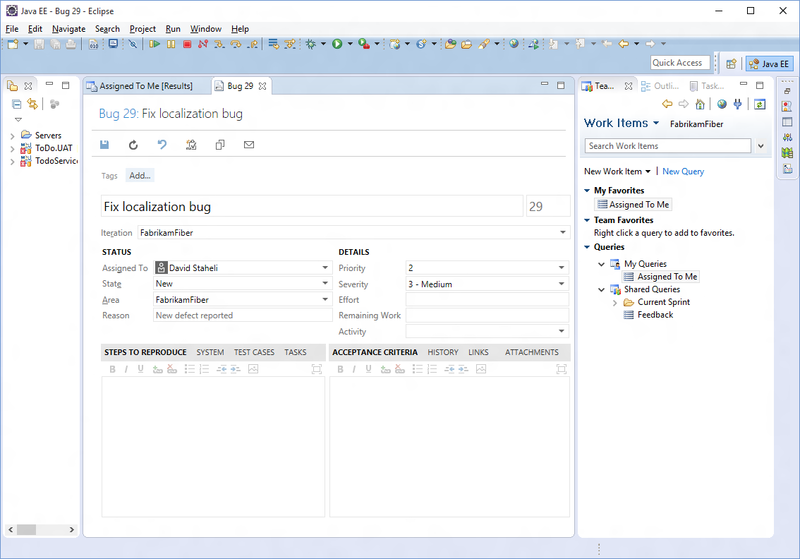 Full access to TFS Version Control (TFVC), including check-in, check-out, sync, branch, merge, diff, etc. 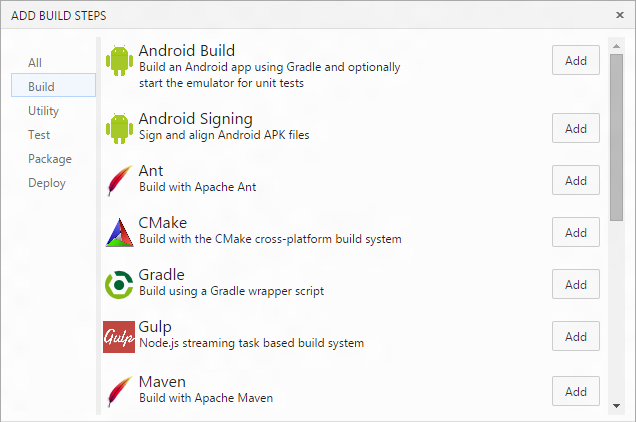 Full access to TFS Build functionality including the ability to create Ant, Maven, or Gradle based builds in TFS, publish JUnit test results into TFS or Visual Studio Team Services, monitor progress and handle results. This is fully compatible with all Team Foundation Build types including Gated Check-in and Continuous Integration Builds. Localization / Translation Your language, your words, your plug-in for you! Along with open-sourced Team Explorer Everywhere (TEE) source code on GitHub , we are making it possible for anyone to contribute translations in your native language. With these changes, you can now improve existing translated resources, translate updated resources, or even provide new language support TEE did not have before. Your contribution will be part of the TEE Plug-in in your language for everyone to use. We highly appreciate your efforts, and we welcome your feedback and suggestions on the TEE community localization process. Your contribution could be in next release! Please click Localization for details on how to contribute in TEE community translation effort. Feel free to contact us if you have any questions. Happy contributing! For more information, including system requirements and details on command line connectivity to Team Foundation Server from Unix-based systems, see the Team Explorer Everywhere page. 9 Cannot continue the operation. There is another install operation in progress. By adding the following code below to your website you will be able to add an install button for Team Explorer Everywhere. I'm facing issue integrating TFS plugin with STS and JDK 11. On opening the TFS perspective an error pops up and I'm unable to view the TFS server folders. The same setup of STS along with TFS plugin works properly with JDK 8. This issue is observed only with JDK 11 as a differentiator. Anybody facing the same issue? Any support will be very helpful. Thanks in advance. Can you let me know if it supports TFS 2005? if not anyplans on making it compatable to TFS 2005? Earlier versions of the TEE plugin for eclipse worked fine, but now I get "authentication not supported" every time I try to Import Repository from a Git repo. Steps to reproduce (references to TFS server, team project, and repository below are bogus for illustration only): Install brand new eclipse 4.5.2; Open Eclipse against empty workspace; Install latest TEE plugin (14.0.2) from Eclipse Marketplace; Connect to TFS server at [TFS server url]; Select Git-based Team Project MyTeamProject; open Git Repositories tab; right-click repository MyGitRepo and select Import Repository; step through the wizard until clicking Next on the Clone Summary screen results in the error message: "Clone operation failed: Error cloning the MyGitRepo repository. [url to TFS-based MyGitRepo]: authentication not supported". NOTE: I have completely wiped out my eclipse installation and installed fresh, to no avail. ALSO NOTE: The error message "authentication not supported" is identical to the error message that I get if I try to use Eclipse's built-in jgit/egit implementation to access the TFS Git repo - seemingly because TFS 2013 requires only NTLM by default (and our internal hosting team won't allow BASIC auth), and jgit does not support NTLM. So it's almost as if TEE is delegating the Git repo access to jgit, which fails due to lack of NTLM support. Can you add issue at https://github.com/Microsoft/team-explorer-everywhere/issues ? Well, Microsoft TFS team should show that they are committed to support technologies, that were previously names as supported, in every major product version. MSDN boards have a lot of people complaining about this error. "How to solve "Error querying project collections"? error when getting projects from TFS in eclipse. " After installing TFS plugin to Eclipse and adding our server info, we tried to connect (https protocol). Since TFS uses Java to verify the certificate chain we tried adding certificates to the keystore, but due to configuration issues outside our control (corporate parent) we were unable to get that to work. Click "Accept untrusted SSL certificates" box. This allowed a connection to our server. There is no way to create team project with git from eclipse plugin. I can not create team project from the browser (on premise) or eclipse plugin. 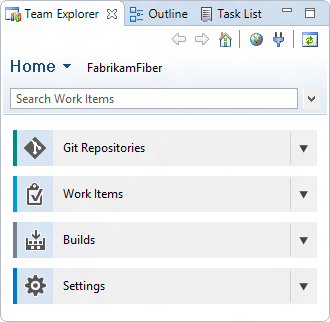 I can only create team project from Visual Studio 2013. Used Team Foundation Server 2013 (on premise). Unfortuantely, my local TFS instance is setup with an underscore in the server name. Because of this I'm unable to setup a connection to the server. When I use "http:\\tfs2012_at:8080\tfs" I get "Using a host name that contains underscores is not supported" in the preview box and when I use "http:\\tfs2012%5Fat:8080\tfs" I get "Server name cannot be empty" in the preview box. Either way clicking the OK button does nothing and the server connection is not added. Is this a bug or can I work around this somehow? Can anyone please post a working download link for the "TFS Plug-in for Eclipse" plugin ? The install button doesn't work in Eclipse Juno and in Eclipse Marketplace the TFS-Plugin is also not shown. 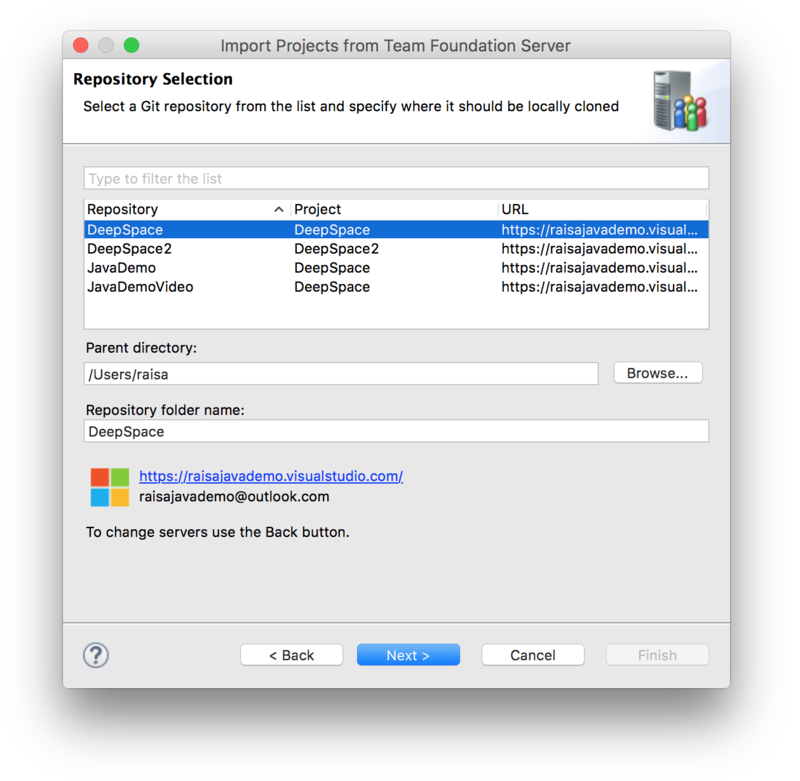 With a new TFS 2012 support for GIT as the source repository, can this plug-in will support the TFS-GIT source repository. Will it continue to provide all the features like change set traceability, gated check-in etc., to TFS-GIT? I tried the new TFS plugin in Juno, cannot get it to work when server requires certificate. It always fails with "The page requires a client certificate" in the ssl debug log (and 403 presented to the user). The old TFS plugin works fine under same Eclipse/ssl configuration. where is 'r' in 'dl.microsoft.com' ? I receive the following error message when trying to install this plug-in. Unable to read repository at http://dl.micosoft.com/eclipse/tfs/. http://dl.micosoft.com/eclipse/tfs/ is not a valid repository location. If I go to that URL I just get "Error. Page cannot be displayed. Please contact your service provider for more details." so I'm guessing the hosting is down for the actual plugin.